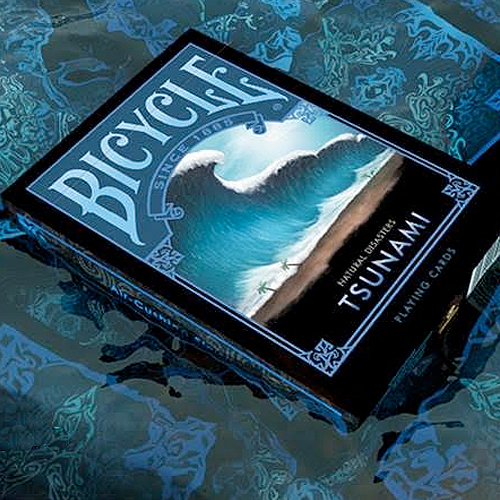 The Bicycle Natural Disasters "Tsunami" Playing Cards is the sixth in a series of 7 natural disasters. All the natural disasters are the deadliest forces that mother nature has to offer. Be sure to take shelter! This deck is about the devastating Tsunami. Printed by USPCC. Custom Pips. Air-Cushion Finish. Custom Seal. • The cards are poker size and of the usual Bicycle quality. Αυτό το προϊόν προστέθηκε στον κατάλογό μας την Friday 30 June, 2017.